Attending CMC usually means living at CMC. Approximately 94 percent of CMC students live on campus and take an active part in residence hall activities and campus events. Students may live off-campus with the permission of the dean of students. Campus living is convenient, and the dorms are comfortable; all rooms are good size with ample closet space, and are furnished with a bed and mattress, trash and recycling cans, bureau, shelf, desk, and desk chair for each student. 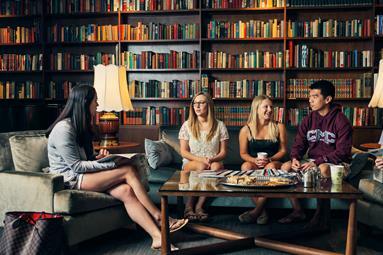 Eleven of the 13 residence halls have lounges for meetings and social activities. Appleby, Boswell, Green, and Wohlford Halls (North Quad) are suite-style with rooms opening to the outside. The suites are comprised of four connected double rooms that share a common bathroom. Benson and Marks Halls (Mid Quad) are traditional residence halls comprised of single and double rooms. Crown, Beckett, Phillips, and Berger Halls (Mid Quad) are similar to Benson and Marks but also have triple rooms. Stark, Fawcett, and Auen Halls (South Quad) are tower-style with 7 or 8 floors and are comprised of single, double, and triple rooms. Housing for returning students is also available in the CMC student apartments. There are 34 four-person apartments, two single studios, and four double studios which house a total of 146 students. The four-person units have four bedrooms and two bathrooms. Each unit is furnished and has a fully-equipped kitchen. Each year, the Dean of Students Office hires 18 seniors to serve as Resident Assistants (RA) for each residence hall and the Student Apartments. RAs are responsible for many aspects of residential life, including, but not limited to: mentoring and advising residents in the hall, enforcing College policies, building community through sponsored events, and reporting physical plant maintenance issues. All students living in the residence halls must sign-up for a meal plan. The meal plan allows students to eat meals at both Collins Dining Hall as well as at any of the other Claremont Colleges’ dining halls. Students living off-campus may also purchase a meal plan or pay for individual meals in Collins Dining Hall. In addition to the dining halls, students have access to The Hub in the Emett Student Center where students can purchase made-to-order meals, pre-made meals, snacks, and drinks. The Hub offers interior and patio seating, three televisions with cable, and a pool table. The other Claremont Colleges have coffee shops accessible to CMC students. Student self-government has been the norm at CMC almost since the school’s founding, being considered a highly appropriate way for students to develop the leadership skills they will need in their professional careers. All CMC students are members of The Associated Students of Claremont McKenna College (ASCMC), a corporation. The Executive Council is responsible for administering student activities. It formulates the annual budget, authorizes expenditures from the student body treasury, and appoints committees. The Student Senate considers recommendations concerning policy from its members, the Executive Council, or any CMC student, and makes appointments to student posts. CMC students can participate in more than 70 CMC and Claremont-wide clubs and organizations. Activities include club sports, organizations for students and faculty in academic disciplines, forensics, community service, music and theater, and literary activities. CMC students participate in several 5-College periodicals or newsletters whose staffs include CMC students. The Forum is an on-line news website produced by CMC students. The orientation program, which precedes the beginning of the academic year in the fall, is aimed at helping new students transition into life at CMC. It includes an introduction to residential life and college policies, information about the curriculum, assistance with course selection, discussions with faculty members, as well as social events and opportunities to meet students from all of The Claremont Colleges. Orientation is required for all new students. During the first day there is also an orientation program for parents. Prior to orientation new students are invited to participate in the Welcome Orientation Adventure (W.O.A.!) program. W.O.A.! is a student-run program designed to welcome new students to CMC and to ease the transition into college life. Through a shared experience at local outdoor hotspots and community service projects, students begin forming long-lasting friendships that provide a great starting point for the first year. All trips are coed with both male and female student leaders. International Place provides a special orientation program for international students prior to CMC’s new student orientation. The Center for Civic Engagement develops student programming in the areas of service and citizenship and supports student efforts in these areas. CMC students are strongly encouraged to participate in community service programs and civic activities. The CCE employs student coordinators to develop and manage projects and programs for students, including a variety of community service opportunities throughout the year. Additionally, civic education programs, including voter registration drives and student debates, are held each year. Opportunities to tutor local elementary school children are available through several tutorial programs coordinated by the CCE. In addition to service opportunities through the CCE, student service organizations, such as Rotaract and Circle K, offer a variety of service experiences throughout the year. The Office of the Chaplains in McAlister Center also runs an extensive community service program. CMC’s new student orientation program each fall includes a community service project, which provides an opportunity for new students to learn about the greater Claremont community. The CCE is located in the Office of the Dean of Students in Heggblade Center. The development of each student is a key goal of the educational philosophy at CMC, and all staff members, including the president, the deans, faculty, and administrators, are available to students for counseling and advice. Faculty and administrators are encouraged to meet either formally or informally with students. The formal academic advising program is coordinated by the Dean of the Faculty and academic advising of both majors and undecided students is the responsibility of the faculty. Prior to their arrival on campus, new students are assigned faculty advisors, usually in the area of their preferred major, with whom they meet for counsel and advice during orientation. During their first year at the College most students continue to consult with their orientation advisors about registration and other academic issues. Students are encouraged to select a faculty advisor with academic interests similar to their own and should change advisors if they officially declare a new major or change majors. Students may change advisors with permission of the new advisor. Despite living off-campus, CMC graduate students are fully integrated into campus life through classes, co-curricular programming, campus resources, meals, and athletics. Graduate students are subject to CMC regulations and policies and should refer to the CMC Graduate Student Handbook for additional information. Assistance with nearby off-campus housing is available through the CUC Real Estate office. CMC’s code of conduct is designed to maintain an environment that promotes its educational mission. The College expects all students to respect the persons and property of all members of the College community, and to conduct themselves in accordance with the rules of its educational and administrative processes. A detailed explanation of the code of conduct and CMC’s discipline procedures is provided in The Basic Rule of Conduct and Discipline Procedures. Sophomores, juniors, and seniors may park a vehicle in designated CMC parking lots with valid registrations. Freshmen are not permitted to have cars on campus. All motor vehicles must be registered with the Campus Safety Department during college registration, or within three days after the vehicle is brought to Claremont; the fee for registration is $75 per semester. To register, students must furnish evidence of liability insurance. For temporary use (two weeks or less), students may obtain temporary permits from the Campus Safety Department; there is no fee for these permits, but permits must be obtained within three days of bringing the vehicle to Claremont. When vehicles are registered, students will receive information on College parking regulations and state and local laws. Students are required to display college registration tags in their vehicles any time they are parked on the CMC campus. CMC students may park only in lots designated for CMC students. The City of Claremont does not allow residents to park vehicles on any city streets overnight. Failure to comply with any motor vehicle regulation is a violation of the Basic Rule of Conduct. The penalty may be a fine, booting, towing, loss of campus driving privileges, or suspension. Out-of-state students who are under 18 (or over 18 and intend to work full-time), who wish to drive in California must, within 20 days after entering the state, contact a local office of the state Department of Motor Vehicles to verify the validity of their driver’s license and the adequacy of their insurance. Mopeds must be registered with Campus Safety and may not be operated on the interior of the campus (sidewalks, athletic fields, etc.). Bicycles must be registered with the City of Claremont; Campus Safety may conduct this registration on the student’s behalf. In a setting that welcomes visitors as if they were guests in CMC’s home, the Marian Miner Cook Athenaeum (MMCA) is a gathering place that is unique in American higher education. The facility serves as an informal meeting place for students, as well as the official site for more formal gatherings of students, faculty, and distinguished guests. The Athenaeum also hosts lunch and dinner meetings for academic classes, student organizations, and official functions of the College, giving students and faculty an opportunity to integrate their academic and social lives. The Athenaeum features distinguished speakers and performers who join students and faculty for dinner or lunch every Monday through Thursday during the semester. Following dinner or lunch, each guest speaker presents a lecture or performance and engages in discussion with students and guests. The lectures and discussions are open to members of all The Claremont Colleges, as well as the general public. Two Athenaeum student fellows, along with the Athenaeum Advisory Committee made up of students and faculty, assist the Director in planning the program series. CMC students enjoy technology services through the efforts of the Department of Information Technology Services (ITS). ITS hosts an extensive wired network, which connects all dorms, classrooms, and offices, and a wireless network available in most spaces across the campus. Students at CMC are provided with a College email account and receive free access to network facilities from all dorm rooms via both wired network ports and high speed wireless access points, which link them both to the internet and to campus resources, such as high-quality printers and network storage drives. ITS delivers TV channels to students over CMC’s network infrastructure. All residents of CMC dorms and apartments are able to view TV channels KCBS (Channel 2), KNBC (Channel 4), KTLA (Channel 5), KABC (Channel 7), KCAL (Channel 9), FOX (Channel 11), and KCOP (Channel 13). Direct support services are provided to CMC students through the Student Technology Assistant Team (STAT) of ITS. Each residence hall is served by a Resident Technology Assistant (RTA) who is available to provide on-site computer assistance to dorm residents through drop-in sessions, office hours, and by appointment. CMC’s student computing resources are extensive. Poppa Lab, the primary campus computing facility, hosts 33 PC’s and four Macintosh workstations, and is open 24 hours per day. Poppa Lab provides students with access to high-capacity black-and-white and color laser printing, as well as resources for scanning and video editing. South Lab, located on the first floor of Stark Hall and also open 24/7, hosts 14 PC workstations and a high-capacity black-and-white printer. The Ryal Residential Lab is located in Phillips Hall; its 18 workstations and laser printing are available 24/7. The Poppa Family Technology Classroom in the Kravis Building is open most evenings as a student lab, with 32 PCs and a black-and-white printer, and offers students the opportunity to work collectively on group projects. All teaching spaces at CMC are connected to the campus network, and all classrooms are “smart,” with full multimedia presentation and data access capabilities. These rooms offer the latest in instructional technology, including video and computer projection, video conferencing, closed-circuit classroom sharing, and a broad range of related features. There are two primary computer teaching labs. The Poppa Family Technology Classroom is used for smaller classes and the Fletcher B. Jones classroom, a larger lecture hall in Roberts North Hall, has individual workstations for 46 students. ITS also provides a wide range of media services, designed to support both production and distribution of audio-visual materials. Digital cameras and DV camcorders are available free of charge for students to check out for generating their own films. Once projects have been filmed, students have 24-hour access to digital video editing facilities in Poppa Lab, where they can produce a finished product. In general, consulting sessions at the Center for Writing & Public Discourse focus on structure, argumentation, and analysis. Assistance with grammar and other mechanical issues is also available as needed. CMC offers a broad, balanced program of regular physical education, ranging from personal conditioning on weight-training equipment or the climbing wall, to a full range of intramural, recreational, and club sports. CMC students are also welcome to take advantage of physical education courses and activities at the other undergraduate colleges. For further information, see Physical Education . CMC students, together with students from Scripps College and Harvey Mudd College, compete on Claremont-Mudd-Scripps (CMS) teams in intercollegiate competition in the Southern California Intercollegiate Athletic Conference (SCIAC), as a member of NCAA Division III. Career planning is part of an individual’s professional-development. CMC students are encouraged to take advantage of the activities, services, and programs provided by CMC’s Career Services Center (CSC), which is located on the second floor of Heggblade Center. The CSC provides individual counseling, workshops, programming, and employer and graduate/professional school information. The Center also provides help with resume writing, cover letter preparation, interviewing skills, job and internship search strategies, networking, online branding, offer negotiation, and international opportunities. Over 100 companies from various industries come to campus annually to recruit and hire our students and many hundreds more post positions on our 7-College recruiting system, ClaremontConnect. The Center has a small resource library with 3 computer terminals for student use, a variety of career development and industry specific books, and valuable trade and professional journals. Career information is provided to CMC students through the CSC Career Guide, group presentations, regular email messages, electronic newsletters, Facebook, Pinterest, Twitter, LinkedIn and other activities. Student career consultants staff the office from 10am-5pm Monday-Friday and are trained to help students with resumes and cover letters, to provide assistance with the electronic resources offered on our website and ClaremontConnect, and with general career planning advice. This is a drop-in service; there is no need to make an appointment. Beyond the formal services offered by the CSC, all members of the CMC community support students’ career development through teaching and service. Students are encouraged to use their classroom and co-curricular activities to explore career choices and seek opportunities to work and learn. Faculty often invite career-related speakers to classes, host dinners focusing on work-related topics, and network with graduates to whom they may refer current students. The CSC supports these efforts by helping to plan and publicize them. Under the Claremont University Consortium Career Services agreement, each of the seven Claremont Colleges cooperate in providing services and programs to all students. Joint programs such as on-campus recruiting, workshops, and career fairs offer students a wide variety of career information and streamlined programming. CMC students are encouraged to use the career resources on the other Claremont campuses whenever those resources are more available or more relevant to their needs. Thanks to CMC’s strong scholastic reputation, our curricular offerings, and the success of our graduates, we attract a large number and variety of top-quality employers who advertise full-time employment and internship opportunities and interview on campus each year. The Career Services Center maintains a list of organizations that recruit at CMC. 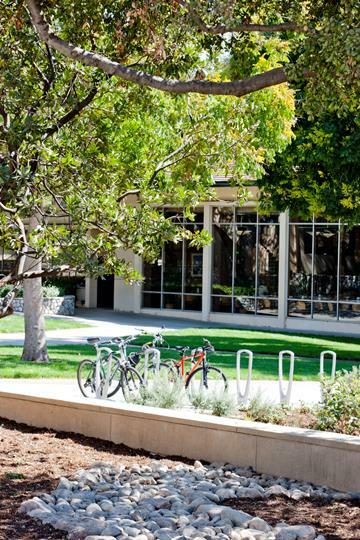 Current students and alumni can find a list of organizations who recruit at The Claremont Colleges at ClaremontConnect. A large percentage of CMC graduates attend graduate or professional schools, either immediately following graduation or within five years of graduation. Many CMC graduates pursue J.D. or M.B.A. degrees, and others seek advanced degrees in the social sciences, humanities, sciences, or medicine. The CSC helps these students by offering electronic resources to search graduate schools and programs, maintaining information about graduate/professional schools, and by hosting presentations by admission representatives. Both faculty and CSC staff provide graduate and professional school advising. Since CMC considers internships an integral part of the learning experience, CMC students are strongly encouraged to identify and obtain internships during their undergraduate years. The CSC assists students seek and obtain internships by helping them research opportunities in their area of interest, soliciting internships, and maintaining directories and databases with hundreds of internship listings. Career Services also coordinates the Sponsored Internship Program, which provides funding for summer internships in the U.S. and abroad and is comprised of these programs: The McKenna International Internship Program, Uoroboros Fellowship, KLI International Internship Program, Peter Adams International Internship Program, Community Service Internship Program, KLI Social Sector Internship Program, Non-Profit Internship Program, and The Political Education Fellowship. CMC’s career support does not end when a student graduates. The CSC offers career services to alumni, including counseling, assessment, web-based job search privileges, and access to alumni networking opportunities.